The Town Council undertakes to provide a wide range of services and facilities encompassing the cemetery, parks, markets, events and many others. This is provided through the work of the Town Councillors and the hard working staff of the Town Council. Buckingham Town Council also liaises with the other local councils; Aylesbury Vale District Council and Buckinghamshire County Council. A summary of what your three local councils are responsible for is viewable here. The Council conducts the majority of business through Full Council, four main committees and several sub-committees, meeting on a regular basis throughout the year. Buckingham also has a Youth Council, comprising of young people who live in or attend school in Buckingham. They meet to discuss issues that are important to the young people of Buckingham. Each year the Town Council must hold an Annual Electors Meeting. This is a chance for members of the public to find out what the Town Council has been doing over the previous year and its intentions for the following year. The Annual Report is a summary of the work completed by the Council. In the Domesday Survey Buckingham appears as county town at the head of the Buckinghamshire section. The Manor of Buckingham is recorded as being held by Walter Giffard, whose family continued to hold it until the reign of Henry VIII. Around 1521, the term ‘manor’ in relation to Buckingham dropped out of use and instead the lordship of Buckingham was referred to as the ‘borough’. The borough was then incorporated by the charter of Mary I in 1554, under which the borough was to be governed by a bailiff and 12 principal burgesses. Following The Municipal Corporations Act 1835, Buckingham became a municipal borough and the bailiff and burgesses were replaced by a Mayor, Aldermen and Councillors. However in 1974, as part of local government reorganisations the borough was dismantled, as the two major authorities Buckinghamshire County Council and Aylesbury Vale District Council had become established. The town was carved up and a lot of the assets previously owned by the Borough Council were sold, which included the Town Hall that dominates the town on the junction of Bridge Street and West Street, known as Cannon Corner. 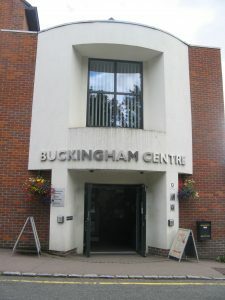 In the same year, Buckingham Town Council was formed due to the need to deliver services to residents at a local level.